In the BiMed project, SCOURING ENVIRONNEMENT, a French SME specialized in scouring and cleaning with environmental friendly blasting processes for a large spectrum of applications including aeronautics, proposes to perform a comprehensive evaluation of two blasting techniques specifically dedicated to paint removal on metallic and composite substrates and varnish removal on interior furniture. In that perspective, SCOURING ENVIRONNEMENT has partnered to RESCOLL, a private research company specialized in composites and polymers and owning the well-known Nadcap accreditation. The BiMed partners expect that the project should pave the way for the qualification and the industrialization of a cost-effective aircraft stripping method based on bicarbonate media blasting in accordance with future environmental regulation. 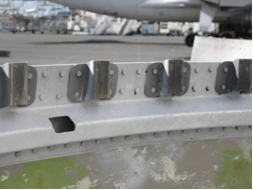 The main objective of the BiMed project is to validate a versatile and cost effective blasting process for removing paint and varnish from aircraft structures and parts that will minimize process waste and comply with environmental regulations without sacrificing efficiency nor causing substrate damage. Aircraft paint removal and repainting are required periodically during the operating lifetime of an aircraft for inspection, maintenance, and repair, as well as for changes in paint schemes. Historically, paint removal has been achieved using chemical strippers containing chlorinated solvents, phenol and chromates, which created hazardous working conditions and were a major source of hazardous-waste generation. Awareness about the risks to human health and the environment gave rise to regulations requiring significant reductions of widely used toxic chemical paint strippers, such as dichloromethane (DCM) and has forced the aeronautic industry to find new ways to remove paint from aircraft. The search for alternative paint removal techniques has led to the use of a wide variety of processes. Up to now, the most widely used alternative in Europe is based on the use of peroxides strippers. However, this method generates large quantities of sludge when the gel is scrapped off the parts and washed off with water. Besides, this method is time consuming because of the long exposure time required and shows unsatisfactory results when not operated at a high enough temperature. Face to impending environmental regulations and increased costs associated to the handling and disposing of such material, it is obvious that aircraft manufacturers and maintenance centres need to investigate alternative paint removal methods. Besides, aircraft manufacturers have, beyond the responsibility of the air traffic, the responsibility of the maintenance and repair of their aircraft, and therefore need to well control the way paint is removed from the aircraft they’ve assembled. It is in this context that DASSAULT AVIATION has proposed the topic Bicarbonate media blasting for paint-varnish removal and dry surface treatment to the Clean Sky Eco-Design ITD. As previously mentioned, it exists a large variety of other processes for aircraft paint removal. Bicarbonate media blasting is a viable alternative and is already used to depaint US military airframe for instance. However, this technique has never been implemented at an industrial scale in Europe nor is homologated by European aircraft manufacturers.